“They were very understanding with my fear of the dentist office. 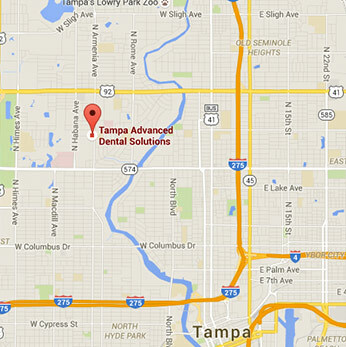 Welcome to Tampa Advanced Dental Solutions! 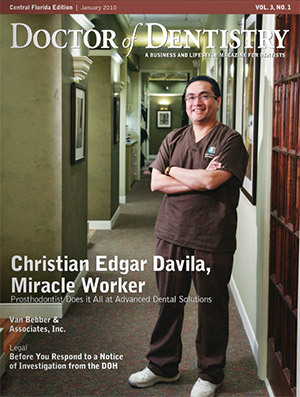 For over twenty years, Dr. Davila and his team have been redefining patients’ expectations of dental care in the Tampa Bay Community. Our philosophy centers on an all-inclusive approach, in which patients are given individualized and affordable dental care at the convenience of one location. We combine the highest standard of care with cutting-edge technology, advanced education, professionalism, and an intense passion for our field. Feel reassured that your smile is our number one priority! Our office provides service in all areas of dentistry, with an emphasis on Prosthodontics and Implantology. We are proud to be one of Tampa Bay’s leading specialty offices with an Implant Center, a fully equipped dental laboratory, and experts in the restoration and replacement of teeth. Our state-of-the-art facility holds the latest cutting-edge technology and modern techniques that enables services such as same-day crowns to full mouth restorations. By remaining at the forefront of modern dentistry, we are able to solve the most complex problems. Tampa Advanced Dental Solutions is an interdisciplinary practice, providing doctors from three of the nine dental specialties. Our doctors are highly trained and qualified professionals, and work together to expand our spectrum of dental knowledge. In addition, patients benefit from working alongside Dr. Davila, a highly trained maxillofacial prosthodontist and certified dental lab technician, in which only few dentists worldwide hold this title. Our doctors have a thorough understanding surrounding all areas of dentistry, and are committed to a continual training and education throughout their careers. Here at Tampa Advanced Dental Solutions, we constantly seek to improve our practice and skills in order to provide the highest quality service in the most efficient manner. Let us help you achieve the smile of your dreams. "In order to be a prosthodontic dentist, you have to be a laboratory dental technician"
"Patients are very appreciative of what we are doing, and that is very satisfying"